Grotek™ is located in the heart of the rich agricultural lands surrounding the Fraser river, in Langley, British Columbia, Canada. Grotek's facility produces consistent quality products for our clients around the world. The main focus at Grotek is to create innovative solutions from initial research, through to a concept, and all the way to an effective product. 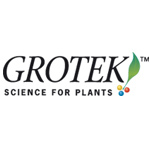 Grotek continues listening to and working with it's worldwide partners in an effort to provide a top quality specialty fertilizer to all those searching for gardening success.